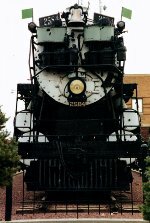 Title: Massive GN Northern #2584 on display at Havre. Title: Great Northern 4-8-4 preserved in Havre, MT. Description: A GN steamer preserved in working shape in Havre MT. Description: Great Northern S-2 class 4-8-4 (Baldwin, 1930) is displayed at the BNSF depot in Havre, MT. Description: GN 2584, on display at the depot. Description: GN 4-8-4 #2584 On Display At The Havre, MT Amtrak Depot.